Look out! You’re surrounded! No matter where you look—east or west—the cool little MJOs are causing mischief. They are creating hurricanes and floods, deadly riptides and uber-cool surf. These cool MJO make storms. The M should stand for Mischief, but technically an MJO is a Madden Julian Oscillations and the cool MJOs bring rainfall. Tracking troublemaking MJOs gives you a good idea on where hurricanes and dry spells will start. Source: NOAA. There are warm and cool MJOs. These tropical areas of wind and water circle the equator, from west to east. The warm MJOs have calm winds and sun-warmed waters. They warm the air above and there are few if any storms. The cooler MJOs, by contrast, are areas of high winds and stormy seas. When these MJOs enter an area that used to be warm, they cool it and create storms. Scientists now keep track of these MJOs and can predict tropical rain, hurricanes and droughts. Find the front of a cool MJO and you will find trouble. Notice, the cool MJOs are in both the East Pacific AND the Atlantic, as well as the Gulf of Mexico and the Caribbean Sea. This creates hurricanes and tropical storms in both the Atlantic and Pacific simultaneously! We are surrounded. 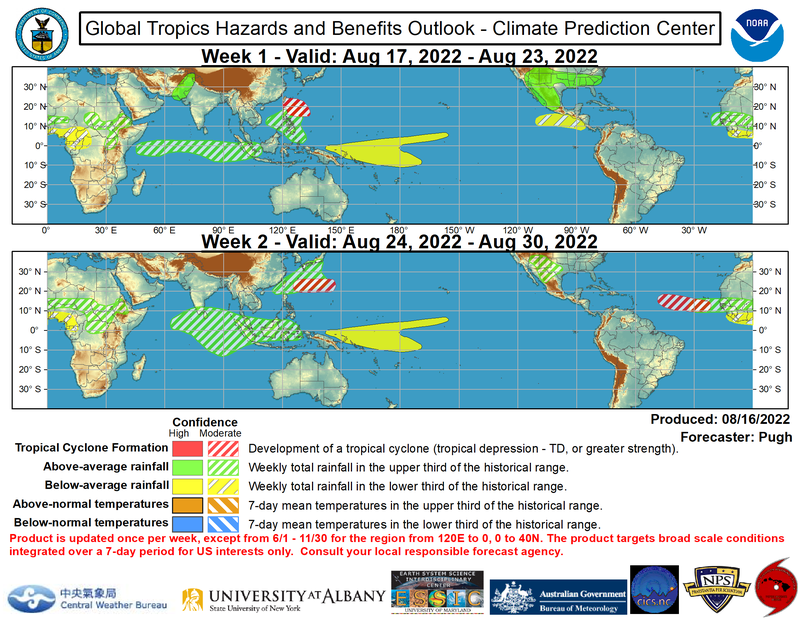 During the last week of August, Hurricane Cristobol in the Atlantic and Hurricane Marie in the Pacific surrounded us. Cristobol lashed the East Coast with 12-foot waves. Marie stormed the coastline near Los Angeles with 25-foot waves! Riptides killed two in New Jersey and a surfer died in California. The following week, it was two tropical storms. The good news was that Dolly steered rain into parched Texas. The bad news was that Norbert steered heavy rains into the Southwest monsoon and Phoenix was flooded. Yes—flash floods hit the desert city of Phoenix, Arizona and even parched Los Angeles received a sprinkle. According to scientists, we should continue to be surrounded through much of September. So grab your umbrella and look out! And—if you are in the drought-stricken West—enjoy the rain. What do you see for our winter season? I'll write about it later this week.